I put together an easy spring look only using pieces I've recently found at Goodwill. Not only is it budget-friendly, but it's perfect for those weeks when you're on the go and don't have time to think about what you're putting on. Making a quick grocery run? Headed to an early dentist appointment? This look will be your new go-to when you need quick and comfortable, STAT. Navy before, but they are so comfortable and lightweight. They are the perfect companions for jeans and a scarf or for putting underneath jackets and cardis. I recommend stocking up on multiple colors! 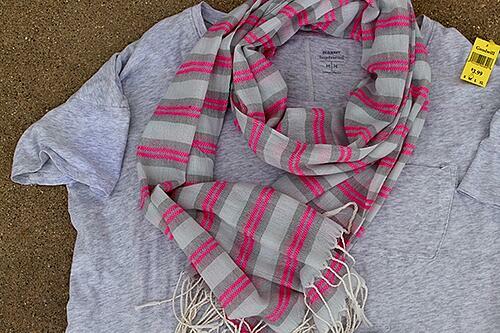 For accessories, I found this eye-catching grey and hot pink striped scarf from Old Navy at Goodwill for $1.99. 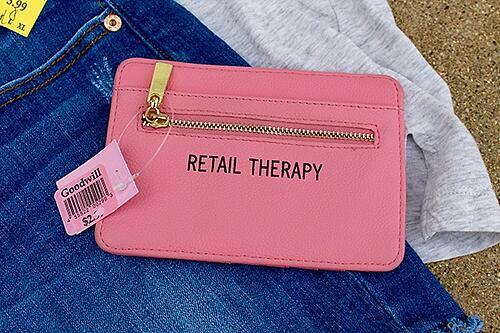 And for something to easily toss my money and credit cards in, I picked up this cute 'retail therapy' cardholder wallet for only $2.99. Total that up and we're at $13! That's less than $15 for an easy-to-wear, wear-anytime look! 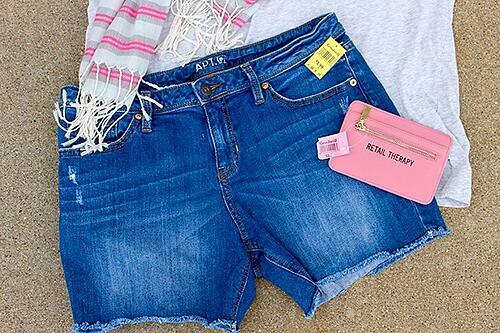 Thrifty style cannot be beat. Now that you're feeling inspired, it's time to hit the local Goodwill to snag casual pieces that will recreate simple looks for your hectic days/weeks.